As part of the Martel Harper "What is Stephen Harper Reading" challenge I chose to read "the Uncommon Reader" By Alan Bennett. It is a novella of 128 pages about the queen discovering reading and how her life and those around her are affected. Front Flap: "When her corgis stray into a mobile library parked near Buckingham Palace, the Queen feels duty-bound to borrow a book. Discovering the joy of reading widely (from J.R. Ackerley, Jean Genet, and Ivy Compton-Burnett to the classics) and intelligently, she finds that her view of the world changes dramatically. Abetted in her new found obsession by Norman, a young man from the royal kitchens, the Queen comes to question the prescribed order of the world and loses patience with the routines of her role as monarch. Her new passion for reading intially alarms the palace staff and soon leads to surprising and very funny consequences for the country at large." It is quite comically as the palace staff scrambles to figure out what is going on with the queen and their distrust of Norman when the Queen promotes him from the kitchen to her personal page. The Queen soon comes to find her routine boring and takes every opportunity to read, including 'having a cold' so she can stay in bed and read. The receiving lines now become a challenge for her equerries (personal attendants) who proffer suggested subjects to attendees to talk about with the Queen. Once she deviates from standard questions to asking "what have you been reading lately" the equerries scramble to try and find books to suggest to folks. The Uncommon Reader is an short enjoyable read and I discovered several authors I had never heard of before, plus new phrases and words to look up in the dictionary, which I rarely have to do. Such as Amanuenis - a person employed to write what another dictates or copy what another has written. More easily said 'a secretary'. The Queen declared herself an Opsimath - a person who becomes a student or learner late in life. The Queen was told to be less Solipsistic - less self absorbed. In philosophy, Solipsistic also means "the theory that only the self exists, or can be proved to exist." Think about that one for a minute. "One thing that the Queen discovers is that there is a writer inside of her that needs to emerge as a result of this reading. Bravo, Queenie!" 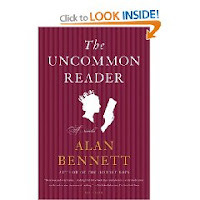 "The Uncommon Reader" by Alan Bennett surprised me. At 120 pages, it’s a novella, a bookish snack with an English twist. Does that make it a scone, a biscuit, or a crimpet? In any case, it was a tasty little morsel of a book." "It's a little charmer of a book, about what might happen were the Queen to take up a hobby"
"This novella was an absolute delight." "Reading this novella was a short, satiric, and delightful experience!" "The Uncommon Reader really is a book for book lovers. I think most bookworms will identify with this book to some extent." I too thought it was a fun read; I'm glad you liked it! Thanks for participating in the Martel-Harper challenge for this quarter! I have heard such good things about this book, and your review is no exception. I really have to get to this one soon. Glad that you enjoyed this one. We only had one link in common, but I think tat will probably change as I get caught up with my pile. We have quite a few books in common.